It's not very often that a side project manages to outshine its members' full time projects, and when you're talking Katatonia (when they were still metal) being the main project, it's an even more impressive feat. Katatonia's 'Brave Murder Day' is certainly up in the top five of my favorite melodic doom albums, but Jonas Renkse and Fredrik Norrman actually managed to top themselves with this, October Tide's debut album. Although it was released in 1997 (by which time, Katatonia were beginning to sound more like Radiohead than a doom band), it was actually recorded in 1995, which is not only the year Katatonia released their last real doom release in the form of the 'For Funerals to Come' EP, but is also notable as being the final time Jonas used harsh vocals on an album. 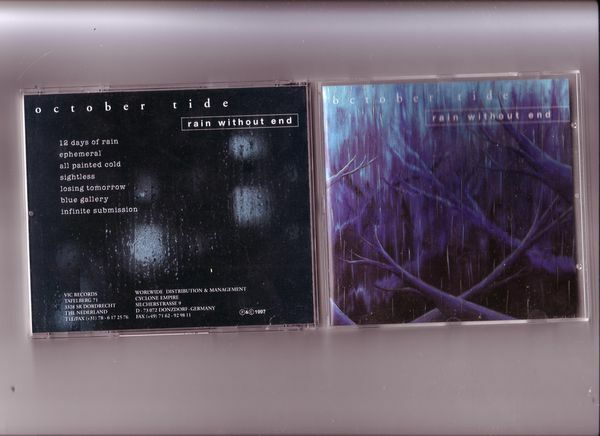 'Rain Without End' could've easily been the twin of 'Brave Murder Day', being packed with dark atmospheres, emotive melodies and chugging guitar work throughout. Although not quite so cyclic riff-wise as 'Brave Murder Day' was, this album certainly gives it a run for its money on the grounds of ingenious riff structuring and sentiment tinged vocal delivery that really makes it a winner in my book. There's a lot of riffage that uses actual licks, rather than chords which reminds me of Paradise Lost's 'Icon' albeit with a notable Katatonia-like sparkle about it. There's also some great acoustic sections which settle nicely amongst the downbeat discordant distortion, adding a softer melodic edge to the proceedings similar to that heard in the work of early Opeth, but again, it never strays too far away from the sound of early Katatonia which is so blatantly set in stone at October Tide's core. Apparently, October Tide was dissolved after the members felt they were putting too much of their good ideas into it that should've been put into their day jobs to greater effect. Hmph, I doubt it. They obviously still feel the need to openly spread the gayness in recent Katatonia, but if they still have a love of metal like I think they do deep down (Jonas also starring in the death metal 'super' group Bloodbath, of course), surely they could've carried on the legacy of 'doom' Katatonia in October Tide? Sigh… I can but dream. Anyhow, this was limited to 1,000 copies upon release in 1997 and goes for crazy money on eBay at present. A fantastic album, brimming with untamed sorrow, passion and remorse. This is the original pressing on Vic Records. It was re issued as a digipack on Vic records again. No rights were sold to peaceville..
And indeed. this members should have quited kata and got this going on..